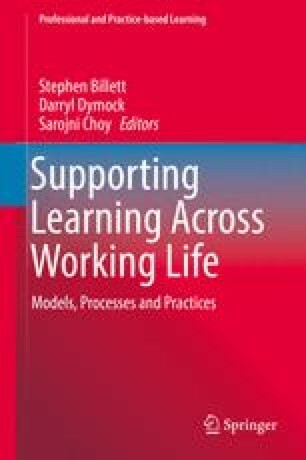 This chapter discusses how practice-based professional development experiences can be used to build occupational capacities and, concurrently, sustain and transform the practices of work communities. It focuses upon how both individual and collective change can be brought about through interactions between professional practitioners within their work community and individuals with particular expertise from outside of the community. The central concern here is to understand how both individual capacities can be further developed and work practice changed to accommodate the transforming nature of occupational practice. The particular case selected to illustrate and elaborate these two kinds of changes (i.e. individuals’ further development and transforming work practice) is that of pharmacists engaging with junior doctors to develop further their prescribing skills, and how this engagement can also assist the continuity and development of the practice community and its ability to provide a more comprehensive and effective patient care. We would like to thank the following for their support and encouragement in the initial phase of this study: Drs Victoria Brazil, Mark Forbes and Trudy Teasdale. We are also grateful for the contributions made by the interview participants. Finally, we acknowledge the support provided by the Queensland Regional Training Network (Clinical Supervision and Support Program).